Sometime back in Autumn my local Store had grey wool on special offer. Just a few weeks earlier I had spotted this Link on one of my fav blogs. And it included the magic words: EASY. You gotta know, the last time I attempted knitting was some time in the early eighties, when my grandma was still around and we had to knit a pair of socks in primary school. I am the type that never finds gloves that fit, they are either to short at the fingers or to wide around the wrists - one more reason to give this a shot! CO33 means you start with 33 stitches. Well with the wool I bought (50gr/ 98m, 50% wool, 50% alpaka) I needed 44 stiches for my wrists. Then I had the second problem: Do you still remember how to start? I couldn't! But there isn't anything you can't find on the WWW these days: Here is a video that helps! Also I used four needles instead of three. It makes it a lot easier for beginners. Another trick: To avoid ladder look-alike stitches in between needles you can knit your full needle and then one extra from the next needle, that way the loose stitch keeps wandering in circles throughout the glove and is hardly visible in the end. Round 1 =k2 pl means 2 knitting stitches and one purl...repeat until round is finished. Round 2 knitting stiches only....now I have to admit I stuck to just round 1 through out the gloves. I wanted to make it even easier for the start. I also more then doubled the amount of rounds, as it was far to short for my liking. After that we get to the tricky part - make way for the thumb - I am no regular knitter (see above) so I had no wool rests, but it was after xmas once I got to the first thumb bit. So I took some wrapping cord and used that instead. 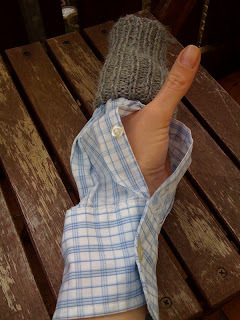 Stitch as many stitches as the widest part of your thumb would need (length wise) plus one. In my case that's 8. Switch those 8 stitches back onto your first needle. Knit them again with regular yarn, and keep going as usual for another 20 rounds. After that, knit off (=BO in knitting cryptics) on the last round with the regular two knitting stitches and one purl. Now you take your 4 needles and try to get 4 stitches that are around the wrapping cord (or in your case maybe real scrap yarn) onto each needle (thats 16 altogether, 8 from each side of the cord). I think now it really helped that my cord was a good bit thicker then the regular yarn, as my loops were bigger and easier to "fish" for. Once your sure you got them all, cut the scrap cord and start knitting for about 8 rounds (depending how long your thumbs are) in the regular two knitting stitches and one purl manner and also knit off same way on last round. Here you go! Now you have a perfect wearable mitten for all those who don't mind that wooly itch. Me and wool are normally a no-go. 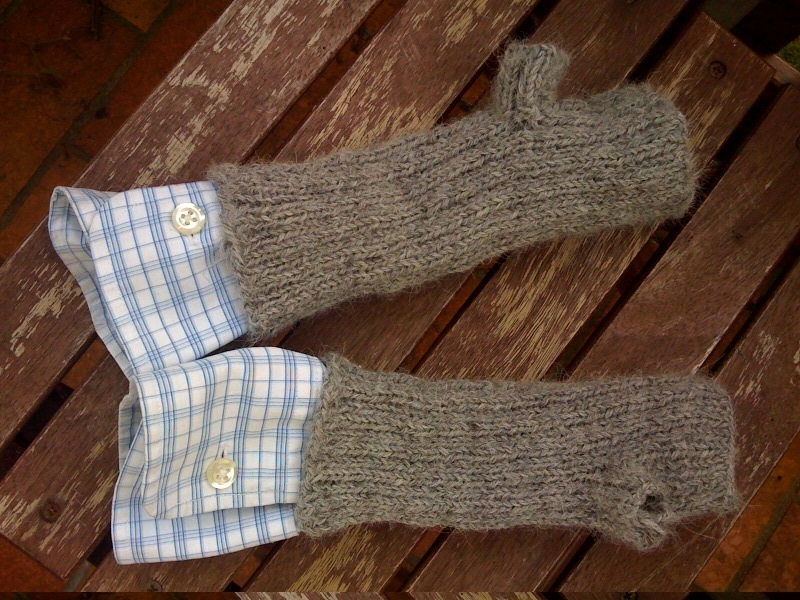 But my husband had all those old shirts, so I cut the two sleeves of one of them, and lined the gloves with them. I didn't make an extra hole for the thumb. I just stuck it through as seen in picture below. I admit, that right there where you see my thumb coming out, I can still feel the itch when wearing them. I had them on a few times now, and I got used to it. To finish off, you just fixate the sleeve to the glove at the top with a few stitches. I have to say, I found knitting very relaxing, I am sure I will give it another shot and this time before the next three decades have gone by!